Book before 31.08.2019 and receive 5% early booking discount. Prices online do not show the discounted rates. Terms and Conditions apply, special offer is subject to availability, please contact us for more details. 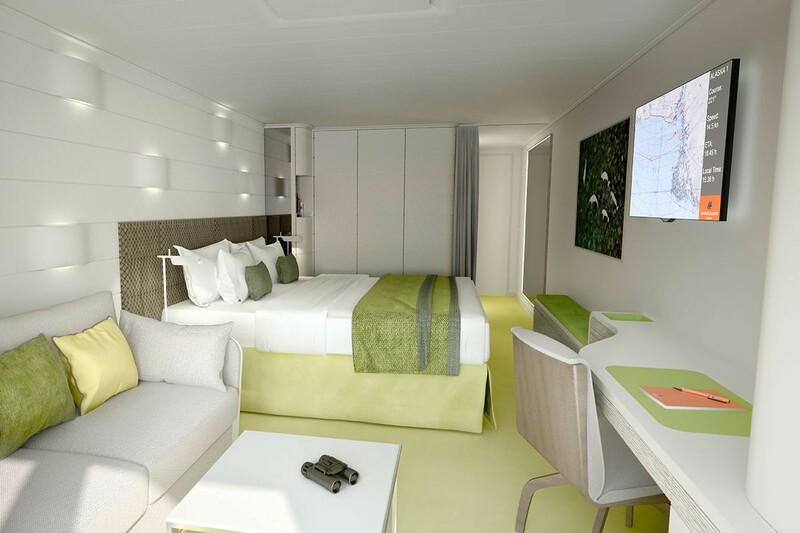 When a guaranteed cabin is booked, a two-berth outside cabin will be provided (limited numbers). 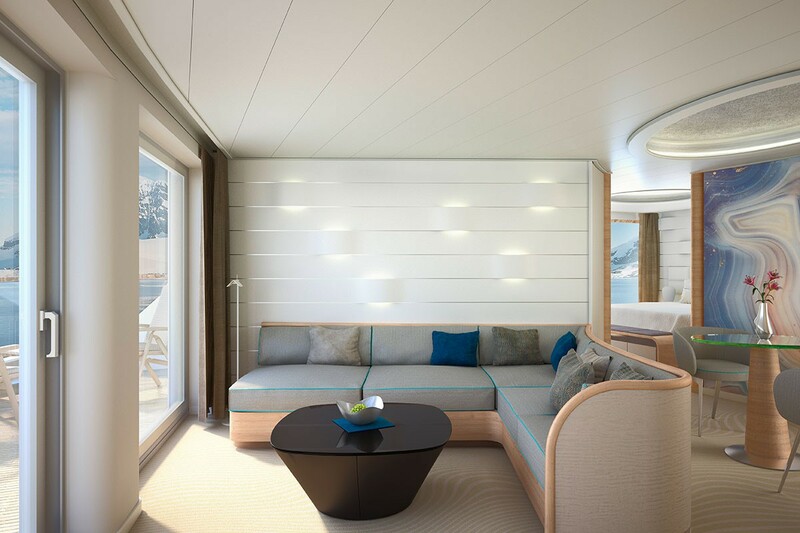 Cabins will be assigned shortly before the beginning of the cruise. 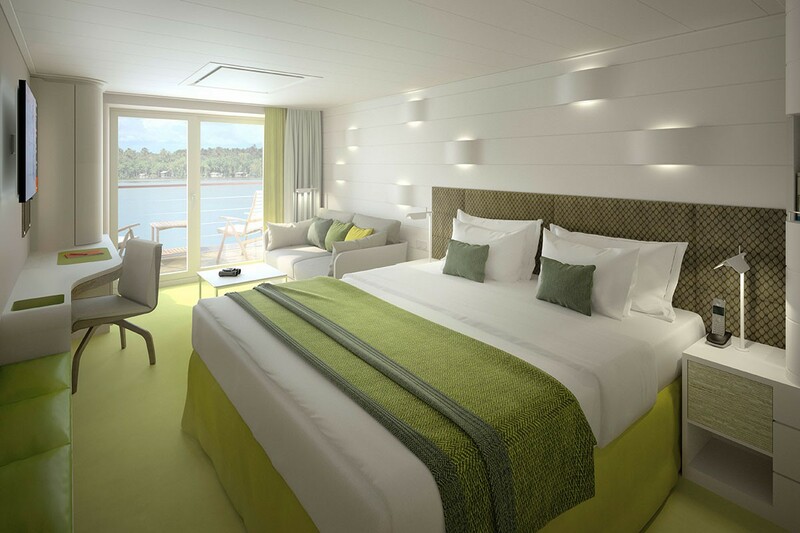 If combined cruises are booked, we are unable to guarantee the same accommodation throughout. 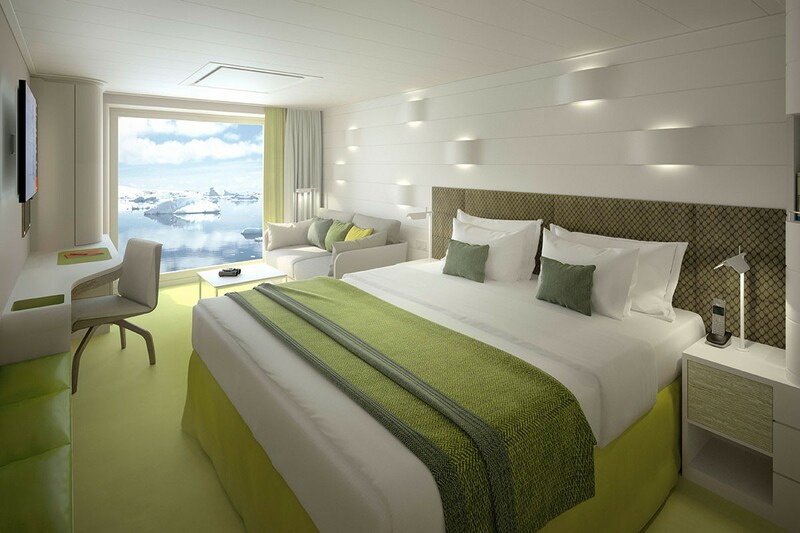 Your cabin number will be sent to you along with the travel documents. From 8.00 to 17.30 hrsOnce upon a time, land, gold and religion lured Portugal’s seafarers across the Atlantic to South America’s east coast. The HANSEATIC inspiration will also set a course for great discoveries and the colonial history of Montevideo: on a bicycle tour through Uruguay’s capital*, majestic buildings exude historical significance, and a historic city tour* provides fascinating insights into the city’s heyday in the 19th and 20th centuries. Experience the overseas influence on a wine tour for connoisseurs* before enjoying days at sea on board the HANSEATIC inspiration. Brazil awaits you on Ilha do Mel with the legendary Encantadas Cave between idyllic bays and pools. The bizarre rock formations of this beautiful island have a mystical aura, and the beauty continues on a canoe tour on Ilha das Pecas*: mangrove forests and salt marshes shape this UNESCO World Heritage Site where – with a little luck – dolphins will appear in the waters. The island of Ilha de Sao Sebastiao is also blessed with a biodiversity that you will explore on a hike in the Atlantic rainforest*. A jeep tour to the waterfalls* will lead you into the unspoilt landscape, where the sight of the plunging waters will take your breath away. From 7.00 to 20.00 hrs Parati is equally impressive: on a walk through historic Parati*, stylish houses with whitewashed facades and colourful windows reflect the riches brought by the great gold rush. Discover the exotic flora of the outlying islands on a schooner ride with snorkelling and swimming*. The better part of Ilha Grande is a natural paradise of barely accessible jungle. On your hike to Lopes Mendes Beach*, follow in the footsteps of the Tupinamba Indians who hunted on these jungle paths: this hidden bay rewards your efforts with powder-white sand and azure water. From 7.00 to 22.00 hrsPure lust for life awaits you in Rio de Janeiro, where Christ the Redeemer welcomes you from Corcovado Mountain. On the city tour and Sugarloaf Mountain* excursion, feel the heart of the city between wonderful colonial buildings and the monumental Maracana Stadium. The mountains above Copacabana Beach house the palace of the former emperor, Dom Pedro II, in Petropolis – the imperial city*. Enjoy the view from the imperial summer residence, or take a helicopter flight over Rio*. From 8.00 to 13.00 hrs Armacao dos Buzios prides itself on culinary temptation: discovered by Jacques Cousteau, this former fishing village is now home to gourmet restaurants. The beaches of Buzios* are best reached by schooner. From 8.00 to 18.00 hrsRevived by a swim in a secluded bay, the former cocoa heartland of Ilheus will sweeten your journey: historic Ilheus with a visit to the Tijuipe Waterfalls* offers unique church architecture and a chance to relax in the picturesque rock pool. Itacare and a boat trip on the Rio Contas* also exude the charm of the landscape. Head into the mysterious rainforest along this labyrinthine river. From 8.00 to 18.00 hrsExplore the Afro-Brazilian way of life in Salvador – for example, on a walk through the old town of Salvador de Bahia*. The “sacred city” earned its UNESCO World Heritage status thanks to sights such as its imposing baroque cathedral. The colonial treasures in the hinterland* of Bahia hold a more subtle fascination: picturesque towns take you back to the age of sugar cane and diamond mining, while decorative buildings share their history. From 9.00 to 18.00 hrsIn Fortaleza, you will take a journey back in time to historic Aquiraz*: extraordinary house facades around the main square reflect the architectural diversity of the centuries. A buggy safari* will reveal some of the most beautiful sandy beaches in South America. While you leave footprints in the white dunes, your cruise will leave impressions in your mind – of your adventure to explore Brazil’s dream destinations. 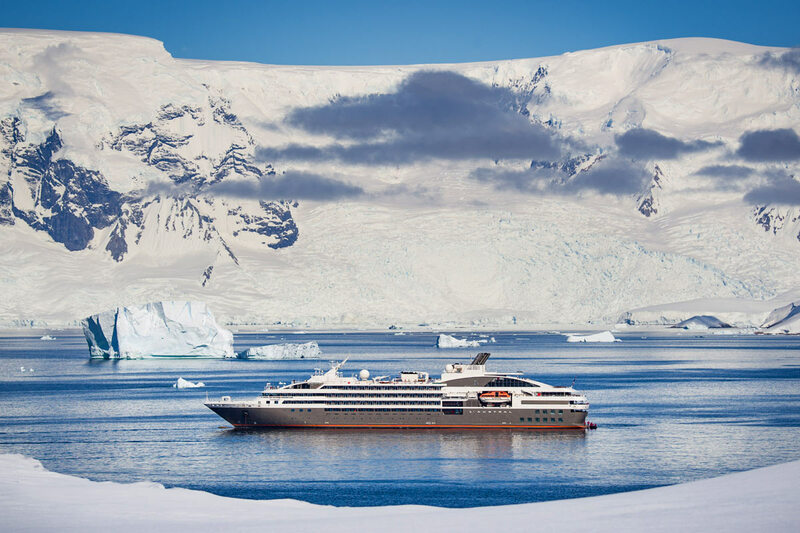 Vessel Type: Five-star expedition ship Length: 138 meters Passenger Capacity: 230 (199 for Antarctic expeditions and cruises around Spitsbergen) Built: 2017 Explore the Ship: * More open deck space than on any other expedition ship * Glass balconies: Float over the ocean with perfect views when watching whales and dolphins, for example * Observation Deck and Lounge: The terraced Observation Deck offers the best views as well as permanently mounted binoculars. Located one deck lower, the Observation Lounge brings the excitement indoors with its 180-degree panoramic view * Bow tour: The new deck track at the bow puts you in the front row for wildlife sightings. * Marina: The marina is the convenient starting point for a variety of warmwater sports – kayaks, stand-up paddle boards and snorkelling equipment are available for you to use Cabins & Suites: * An ocean view with even more: exclusively outside cabins and suites, almost all with balconies or French balconies * Grand Suites with a private veranda * Spaciously designed – enjoy a relaxing stay in rooms from 21 m² (226 ft²) up to 71 m² (764 ft²) in size * Exceptionally equipped – for example, with binoculars, Nordic Walking poles, air conditioning, coffee machine and mini bar (free of charge) * Separable beds in all cabins and suites * Heated wall in bathroom (e.g. for towels and wet parkas) Culinary: * Main restaurant: A relaxed atmosphere at any time of day – from breakfast to dinner, inspired by the region. * Speciality restaurants: The speciality restaurant on the HANSEATIC inspiration will take you on a culinary voyage of discovery: explore exquisite Japanese creations and Peru’s modern and fashionable cooking. Explore new culinary highlights of the North American east coast on the HANSEATIC nature. * Bistro Restaurant: Eat under an open sky. The Bistro Restaurant offers 84 indoor and around 100 outdoor seats. * Bars: spend the evening relaxing with a glass of wine in the Observation Lounge or the HanseAtrium. 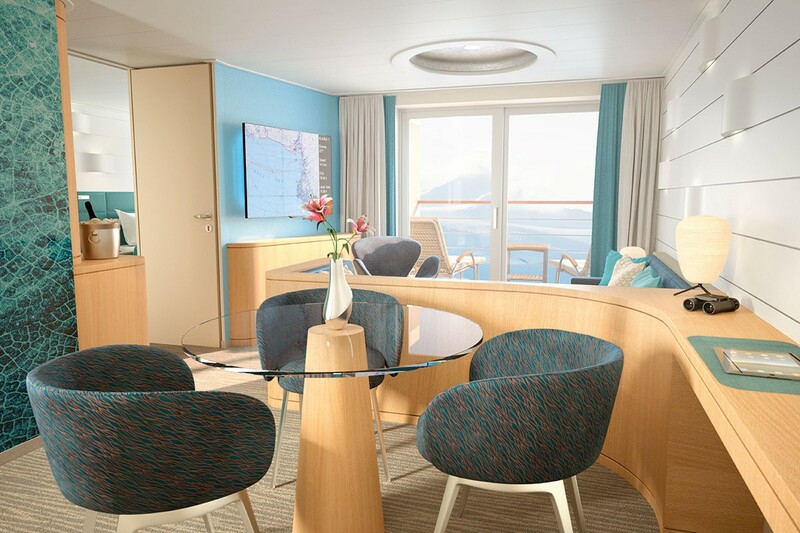 Fitness & Wellness: * Spa area: Our new ships offer professional partial- and full-body massages, classic cosmetic treatments, a hairdresser and treatments for your hands and feet. The Finnish sauna with an ocean view and the steam sauna are the perfect end to every expedition. * Pool area/bar: Thanks to its flexible canopy, the pool area with bar can be enjoyed whatever the weather. Water loungers and a counter-current system offer pure relaxation. * Fitness area: The fitness area, which has been expanded significantly to around 100 m² / 1,076 ft², features up-to-date equipment, a separate course room and an incomparable ocean view. Knowledge On Board: * HanseAtrium: The central HanseAtrium can be used for many different activities; its cutting-edge technology makes it suitable for presentations and expert lectures as well as intensive precaps and recaps. In the evening, the HanseAtrium is transformed into an atmospheric bar where you can see out the day and reflect on your experiences. * Ocean Academy: The Ocean Academy allows you to experience science however you desire. You can use the large media wall and interactive poster to display fascinating information on a wide range of disciplines whenever you like.